US corporate taxation reform: how is it going to affect the financial markets and who will be the winners? The US tax reform has represented, from the beginning of his election campaign, one of the milestones of Trump’s policy, pledging to considerably “lower the business tax rate” and to cut taxes for everyone, “especially for the middle class”. According to the Director of the National Economic Council Gary D. Cohn, this would represent the biggest reform of the taxation system since the Tax Reform Act of 1986, leading to considerable job creation and economic growth. During the last months, the President and the Congress put an intensive effort on this new domestic priority, but understanding which categories of individual and corporate taxpayers would actually be benefited is critical. A lower level of taxation is unlikely to simply imply higher resources available for investors, employees and customers and for reinvesting in innovation and future growth, unlike Rob Arnott, founder and chairman of Research Affiliates, stated. relieving taxes for middle-class families. simplifying the “postcard” tax filing. relieving taxes for businesses, especially for the small ones. ending incentives to ship jobs, capital and tax revenues overseas. broadening the tax base and providing a higher level of fairness by closing special interest tax breaks and loopholes. On October 26, the House voted on a budget blueprint – already approved by the Senate – which includes rules that will allow for a fast-track tax reform, providing for a simple majority to overcome an eventual filibuster. A considerable number of GOP senators was upset over the plan to wipe out the State and Local Tax deduction (SALT), from which high-tax states such as California, New York and Illinois benefit: as a consequence, 20 of them joined Democrats in opposing the measure. According to an analysis by the Tax Policy Center, eliminating the SALT deduction would allow Republicans to offset a significant portion of the planned tax cuts, saving $1.3 trillion over 10 years. On the other hand, the number of Republicans who want to protect it is significant enough to threaten the approval of the reform itself. For this reason, compromising about this topic will probably be necessary. In the second part of the document released on September 27, the focus is on businesses: as for corporate taxation, what are the main points of the reform? The maximum tax rate applied to small businesses is limited to 25 percent. The corporate tax rate is lowered from 35 to 20 percent and most itemized deductions are scrapped out (the effective rate for companies in the S&P 500 is now at about 28 per cent). Businesses are allowed to immediately “expense” the cost of new investments in depreciable assets for at least five years. The incentive to keep foreign profits offshore is ended by exempting them when they are repatriated to the US. Understanding what the impact on financial markets is likely to be is far from straightforward. The top 5 U.S. cash holders – Apple (AAPL, Tech30), Microsoft (MSFT, Tech30), Alphabet (GOODL, Tech30), Cisco (CSCO, Tech30) and Oracle (ORCL, Tech30) – hold 88 per cent of their money overseas. First of all, the tax reform would therefore have the consequence of buoying the demand for equities, boosting stock prices: companies, as a result of an increase in their profits following a repatriation, would start buying back shares. According Goldman Sachs strategists’ estimates, $75bn over the $250bn repatriated to the US would be likely spent on buybacks. On the other hand, being stocks already quite expensive, companies might be willing to consider other uses of their cash. In industries traditionally interested by a high level of competition, the extra financial wiggle room might be used to cut prices in order to gain a larger market share. The trend of global CAPEX, which has not experienced any annual increase since 2012, shows that proceeds from tax gains are unlikely to be used by companies to invest in their own businesses because growth prospects still seem not to be attractive enough. Clearly, the significant uncertainty generates a high level of risk, mainly to the up-side for US stocks. Since Trump’s election in November, the market seems to have already discounted the chance of a tax cut: S&P 500 gained more than $3.5 trillion in value. The best way to understand what are the odds that investors are placing on corporate tax cuts is by looking at companies which would benefit the most from it. Indeed, in September, during the week previous to the release of the document, Goldman Sachs’ basket of the 50 S&P 500 companies with the highest effective tax rate – dominated by tech companies – outperformed by 2.3 per cent the 50 firms with the lowest tax rate. 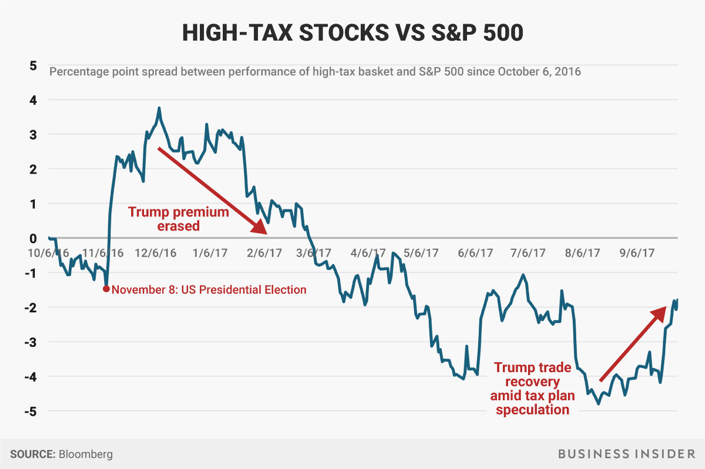 As shown in the graph, the spread with the S&P 500 remained negative, but increased substantially, driven by the failure of the GOP effort to repeal the Obamacare, which moved the focus on to taxes. ​However, according to Morgan Stanley, such a tax reform would certainly not have the impact of reshaping the US stock market. The upcoming months will probably see Republicans try to convince Americans that this is actually a “middle class” tax cut and to figure out how to contain an inevitable raise in the level of public debt within the limit of $1.5tn over 10 years set by the Congress.